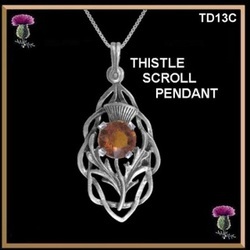 This lovely scroll pendant features the national flower of Scotland, the thistle in all it's glory. Exquisitely hand crafted in our studio from fine sterling silver, it measures 1-11/16" (43mm) and showcases your choice of an amethyst or cairngorm stone. We carry a beautiful range of thistle designs, some in a variety of matching products from pendants and cuff links to earrings and brooches. There is certain to be a design and product that fits any budget. Sterling silver with an amethyst or cairingorm (citrine) imitation stone. 18" high quality box link chain included.